SILICON SLOPES, Utah – January 11, 2017 – Today Domo announced that Theo Epstein, President of Baseball Operations for the Chicago Cubs, and Nate Silver, Statistician and Editor-in-Chief of FiveThirtyEight, will keynote at Domopalooza 2017. Both Epstein and Silver, newsmakers in 2016’s most talked about events – Major League Baseball’s 112th World Series and the 58th U.S. presidential election, will share their insights on how to leverage data to defy the odds and determine outcomes. 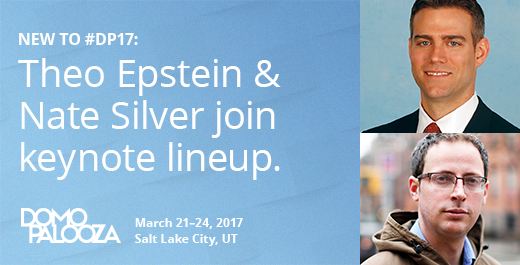 Epstein will take the stage on March 23; Silver will present on March 24. Today’s announcement is the first of many Domo will make on its captivating lineup of Domopalooza keynotes, featured customers and high-energy entertainment. In 2016, Epstein made history by leading his second drought-stricken Major League Baseball (MLB) team to World Series victory. Under Epstein, the Chicago Cubs, afflicted by the so-called “Curse of the Billy Goat,” won their first World Series championship in 108 years. This victory came just 12 years after Epstein led the Boston Red Sox to their first World Series championship in 86 years, which was followed by another championship three years later. With the Boston Red Sox, Epstein was the youngest general manager in the history of the MLB, and has been lauded as having drafted and developed some of the best talents in MLB, all through leveraging data to optimize team performance. 2016 for Silver was about predicting the unpredictable. Silver gained national attention during the 2008 presidential election, when he correctly predicted the results of the primaries and the presidential winner in 49 states. Partnering with ESPN, his award-winning website FiveThirtyEight broadened his trademark analysis to politics, sports, big data, and more. Following 2016’s unprecedented election, Silver has highlighted the strengths and weaknesses of modern prediction science – and ways to prepare for the unpredictable. In its third year, Domopalooza is designed to educate, inform and inspire Domo’s fast-growing community of users from the world’s most progressive organizations and most recognizable brands. Domopalooza will be held March 21 – 24, 2017, at The Grand America Hotel in Salt Lake City. From keynote presentations to more than 35 breakout sessions, hands-on personalized training and networking opportunities, attendees will gain valuable lessons from industry experts and fellow customers. They’ll gain new insights on how to leverage Domo, and learn how all employees – from the CEO to front line workers – can use Domo to optimize business performance by connecting them to the right data and people they need to improve business results.